I-29 moo University Collaboration will host the 3rd Annual Dairy Beef Short Course on March 28th, 2017 at the Denny Sanford Premier Center, Sioux Falls, South Dakota. This course is a pre-conference educational seminar held in conjunction with the Central Plains Dairy Expo. The dairy industry is currently experiencing low dairy profit margins. Join Citizens Savings Bank for a two-hour program addressing the dairy economy, dairy management, feed costs and returns, labor costs, issues, and efficiencies. The program will begin at 1:00 P.M on June 14th at the NICC Calmar Campus, Wilder Business Center Auditorium. Featured speakers include Jenn Bentley, ISUEO Dairy Field Specialist and Gary Sipiorski, Dairy Development Manager, Vita Plus and Past President/Loan Officer with Citizens State Bank. Informational meeting coordinated by Citizens Savings Bank. Iowa State University (ISU) Extension and Outreach will host “Who Wants to Be a Millionaire? Dairy Edition,” a class geared towards helping dairy producers improve their financial knowledge and bottom line. The class will be held on Wednesday, Aug. 16, from 9:30 a.m. to 11:45 a.m. at the ISU Extension and Outreach – Sioux County office in Orange City. ISU Dairy Specialist Larry Tranel will present enterprise analysis and information on the Millionaire Model Farm, milking system upgrades including robots, and information on organic and grazing dairies. Northwest Iowa Extension Dairy Specialist Fred Hall will also share updated information relevant to the drought. He and Tranel will both be available to answer questions. Hall said that the remainder of the meeting will be somewhat informal and will be driven by the interests and needs of those dairy producers in attendance. the issues of dairy finances, land prices and farm economy issues. All agricultural lenders will receive useful information during the Siouxland Dairy Lender’s Seminar on Thursday, November 2 at the Forrester Community Center in Rock Rapids, Iowa. Lenders who serve agricultural clients and especially lenders who work with dairymen in Iowa, Minnesota, Nebraska and South Dakota are encouraged to attend. This year’s focus is on market outlooks for livestock, grains and dairy, long-term weather influences for agriculture plus dairy finances and ag policy. The program begins with registration at 9 am, with programs running from 9:30 am to 4 pm. “ Ag lenders know that price risk management continues to be a major variable for profitability in many ag enterprises and understanding the current market trends and risks is a necessary part of farm management assistance”, says NW Iowa Extension Dairy Field Specialist Fred M. Hall. “Lenders working with dairymen have the additional necessity of understanding a complex system of milk marketing, labor inputs and federal policy implications,” continued Hall. 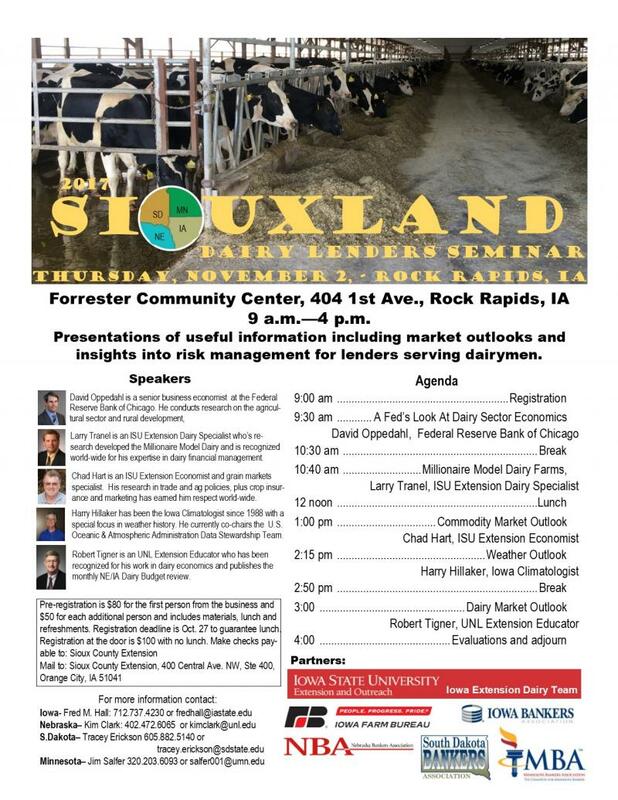 The list of nationally recognized presenters include; David Oppedahl, Senior Business Economist, Federal Reserve Bank of Chicago presenting “A Fed’s Look at Dairy Economics”; Larry Tranel, ISU Extension Dairy Specialist presenting “Millionaire Model Dairy Farms”; Chad Hart, ISU Extension Economist presenting “Commodity Market Review and Outlook”; Harry Hillaker, Iowa Climatologist presenting “Agricultural Weather Outlook”; and Robert Tigner, UNL Extension Educator presenting “Dairy Market Review and Outlook”. The cost of the program is $80 for the first person from an institution and $50 for each additional person that have made the registration by October 27. After that date, including at the door all registrations will be $100 and will not include the lunch. To register, contact the Sioux County Extension office at 712.737.4230 or email Fred M. Hall at fredhall@iastate.edu for registration information.